Chris Robinson speaks with WBA middleweight champion Gennady Golovkin (28-0, 25 KO’s) inside of the Summit Gym in Big Bear, Calif. following his training session for his Feb. 1 match against Osumanu Adama. In this clip, Golovkin discusses his opponent, who he claims to not be too familiar with, and eyes a big 2014 on HBO. Chris Robinson catches up with former lightweight world champion Nate ‘The Galaxxy Warrior’ Campbell, as he shares his thoughts on a possible rematch between Manny Pacquiao and Tim Bradley. 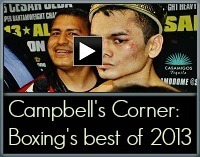 Campbell fought Bradley to a no-contest in August of 2009 and shares his insight into the rematch, specifically why he thinks Manny could do some damage to Tim. Chris Robinson catches up with Belgium featherweight contender Alex Miskirtchian (23-2-1, 9 KO’s) inside of the Summit Gym in Big Bear, Calif.
Click on the thumbnail to hear Alex’s thoughts on his upcoming rematch with Sofiane Takoucht, an eventual meeting with IBF champion Evgeny Gradovich, the upcoming Orlando Salido vs. Vasyl Lomachenko match, what it’s like training with his friend Gennady Golovkin, and more. Chris Robinson catches up with featherweight Jayson Velez (21-0, 15 KO’s) inside of the Summit Gym in Big Bear, Calif.
Click on the thumbnail to hear Velez’s thoughts on his recent victory over Dat Nguyen in Orlando, plus his t take on his friend and promoter Miguel Cotto possibly meeting Sergio Martinez later this year. HustleBoss.com steps inside the Summit Gym in Big Bear, Calif. as WBA middleweight champion Gennady Golovkin (28-0, 25 KO’s) puts in work with his trainer Abel Sanchez ahead of his Feb. 1 defense of his title vs. Ghana’s Osumanu Adama (22-3, 16 KO’s). Click on the thumbnail for an all-access look at Golovkin’s intense training. Chris Robinson catches up with heavyweight contender Mike Perez (20-0, 12 KO’s) inside of the Summit Gym in Big Bear, Calif. as he reflects on his gritty war that sent his opponent, Magomed Abdusalamov into a coma. Perez shows his support to Magomed in the wake of his recovery and reflects back on sparring with fellow contender Deontay Wilder while explaining what it’s like training with Gennady Golovkin. Chris Robinson catches up with WBA middleweight champion Gennady Golovkin (28-0, 25 KO’s) in Big Bear, Calif. as he speaks on Marcos Maidana’s recent upset over Adrien Broner in San Antonio, Tex. Continue on to the video for Golovkin’s thoughts on Broner coming back from defeated, Maidana meeting Floyd Mayweather, and more. Floyd Mayweather is at it again. 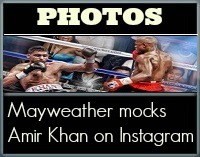 A few days after having some fun poking at Manny Pacquiao and then his trainer Freddie Roach, Mayweather is now turning his attention to two of his possible opponents, Amir Khan and Marcos Maidana. 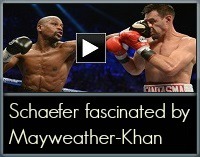 Hit up the thumbnail for a closer look at Mayweather’s latest tweets. Chris Robinson speaks with newly-crowned IBF junior middleweight champion Carlos Molina, who insists he has already agreed to a potential March 8 fight on Showtime pay per view with former titlist and Mexican superstar Saul Alvarez. Molina also gives his take on a possible Miguel Cotto vs. Sergio Martinez meeting as well as a future rematch with Erislandy Lara, who he fought to a draw a few years back. Chris Robinson continues to speak with trainer Naazim Richardson, as he turns his attention to a possible fight between eight-division world champion Manny Pacquiao and his former sparring partner, Ruslan Provodnikov. Despite Provodnikov looking stellar in stopping Mike Alvarado last month, Richardson feels that the Russian’s style is completely tailor-made for Pacquiao. Chris Robinson continues the dialogue with trainer Virgil Hunter, as he breaks down a possible fight between his fighter, former junior welterweight champion Amir Khan, and the sport’s reigning pound for pound king Floyd Mayweather. Hunter has full confidence in his fighter but also admits that he doesn’t have a set game plan for Mayweather at this point. Another update from Las Vegas, as former featherweight world champion Yuriorkis Gamboa is now working with outspoken head coach Floyd Mayweather Sr.
Looks like Gamboa spent some of the holidays in Las Vegas, as was spotted at 50 Cent’s Gym putting in some work with the outspoken coach. 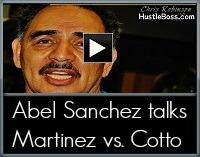 Larry Merchant speaks on Brandon Rios’ tough year; can he bounce back like Marcos Maidana has? Chris Robinson speaks with former HBO analyst Larry Merchant, as he speaks on the tough 2013 campaign of former lightweight champion Brandon Rios, who suffered back to back losses to Mike Alvarado and Manny Pacquiao while also failing a post-fight drug test after the Pacquiao match. Merchant wants to know how Rios will recover and feels we may need to take a page from Marcos Maidana’s career in assessing his return.